Your number has been registered with the North Pole. 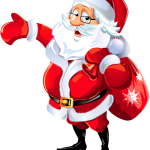 You will receive texts starting December 23rd, 2015 before Santa leaves the North Pole until he returns home on the morning of December 25th, 2015. Merry Christmas!